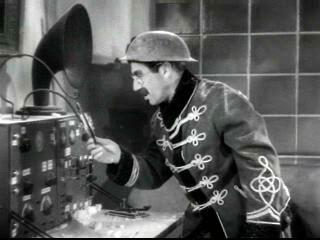 DUCK SOUP is the Marx Brothers classic 1933 send-up of politicians, pomp and power. Critics of the day were divided, but since its rediscovery by college-crowds during the rebellious 60s and 70s it’s come to be regarded as what you could call ESS—Essential Subversive Satire. For years falsely dubbed a money-flop, while not a big hit, it actually came in a decent 32nd place during its year of release. Plot? The nation of Fredonia (“Hail!“) comes under assault and its fearless leader, ‘Rufus T. Firefly’ (Groucho) summons help. Chico, Harpo and Zeppo man the walls. The final desperate fight for Fredonia is riotous. The much put-upon Margaret Dumont takes Fredonia’s side despite constant offense from Firefly, while dastardly Louis Calhern leads the forces of evil Sylvania.